Pain Management Clinic is tucked inside an alley in the posh neighborhood of Cherry Creek in Denver. Inside, the reception area is tastefully decorated, with an Asian feel to the décor. There’s a front desk, and three rooms off the front room: an office for Brittany, who works with the patients; a doctor’s room, an office, and a larger room with an array of edibles. The place is upscale, subdued, and all business; there is nothing to indicate, outside or inside, that Pain Management is a medical marijuana dispensary. And that’s exactly the way owner Miles Zalkin, who opened the clinic in October, 2008, designed it. Security is also understated, through cameras and an alarm system tied to police. One needs to be let in through a buzzer and Pain Management serves its customers by appointment only. Over in the edibles room, the food looks (and smells) delectable; its also created by a professional chef. There’s pumpkin and zucchini bread, cheesecake, pecan bars, and carrot cake. There’s chex mix, and even frozen, organic smoothies with flaxseed. He can satisfy gluten-free, vegan, and sugar-free diets. Miles goes over all of his different strains in another room that’s dominated by a gigantic desk. Pain Management grows their own plants, for cost-control purposes and, says Zalkin, so that he can control the product. He’s chosen to feature a smaller number of strains, approximate ten at any given time. The prices reflect the clinic’s high end: 1/8 gram for $60; ½ ounce is $200. 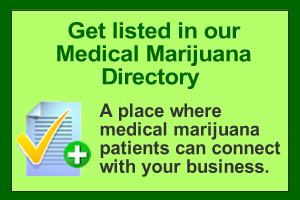 Zalkin’s approach to distinguishing his business in a sea of hundreds of dispensaries is as subtle as the rest of the place: when he was opening Pain Management, he made a strategic decision to buy up some important Internet domain names, among them, www.marijuana.net., a national information portal for medical marijuana patients. He then hired some full-time programmers and writers to create search engine optimized content. He demonstrates by typing, “Denver medical marijuana,” into the Google search box: the second and third websites listed are his. As a result, Zalkin garners all his customers from the Internet. Zalkin is also active in Coloradans for Medical Marijuana Regulation (CMMR), an organization comprised of medical marijuana patients and providers who support responsible regulation of medical marijuana in the state. And Zalkin echoes other dispensary owners when he laments the medical marijuana image sensationalized in the media.